This time of year always provides opportunities to not only catch shows from some of Chicago's finest bands, but to do so while helping out very worthy causes. Coming soon are a couple of benefit concerts to be sure to add to your calendar--Noise for Toys at Subterranean on Saturday, December 15th and Warm, Safe & Sound at Schubas on Thursday, December 20th. 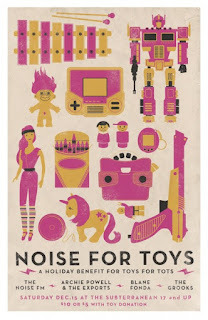 The second annual Noise for Toys--this year featuring The Noise FM, Archie Powell & the Exports, Blane Fonda, and The Grooks--is organized to benefit Toys for Tots, so if you bring a toy to donate you'll get in for half-off. So, for a mere $5 you can rock to the sounds of four great bands and get the warm and fuzzy feeling of knowing you'll help make a kid happy. Plus, the event's Facebook page (linked above) promises an ugly sweater contest and a "photobooth with (a most likely drunken) Santa Clause!" As if all that weren't incentive enough to get the room filled, the bands are also doing a series of videos to plug the event (the first one is up now). The 17+ show begins at 9 p.m., and advance tickets are for sale here. 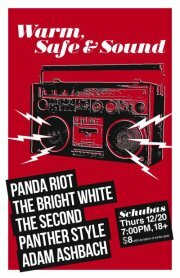 The live-music-for-a-good-cause party will keep going the Thursday after, with the Warm, Safe & Sound benefit at Schubas. You might remember last year's installment of WS&S, organized by The Bright White. The band once again put together the event this year and will play along with Panda Riot, The Second, Panther Style, and Adam Ashbach. Instead of a toy, for this show donating a coat, sweater or any piece of winter clothing at the door will get you in at a discounted price ($8 instead of $12). All of the clothes collected will be donated to the city's homeless. For more on the inspiration behind the event, check out this interview Eric Schelkopf of The Total Scene blog did with The Bright White frontman Matthew Kayser. The show starts at 7 p.m., is 18+, and tickets are available here.